The Schwan Super Rink hosted skaters of all ages and skill levels for its annual REACH Skating Camp July 25-27, where young skaters had the opportunity to work with Team USA figure skaters John Coughlin and Gracie Gold. Coughlin is a two-time national champion pairs skater, while Gold is a two-time national champion and 2014 Olympian. The two skaters hosted on-ice training sessions, meet and greets, question and answer sessions and off-ice preparation seminars. Both Coughlin and Gold are making a point to make it to areas that don’t typically have a lot of elite skaters. 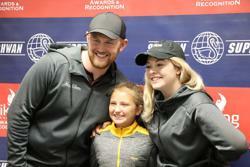 John Coughlin (left) and Gracie Gold pose with a young fan during a meet and greet at the REACH Skating Camp. For Gold, her return to Minnesota brings back some fond memories. She trained at the Schwan Super Rink during the days leading up to the 2016 U.S. Figure Skating National Championships, which was held at the Xcel Energy Center in St. Paul. Gold went on to earn her second national title at the event. While Coughlin has been to Minnesota for skating events, this is his first time visiting the National Sports Center. The two skaters plan on doing skating camps around the country as much as their schedules will allow. Coughlin does commentary at major figure skating competitions, and Gold has begun training again after sitting out the 2017-18 competitive season due to mental health issues.